It’s the final day of my residency at Arteles in Finland. Following the show at Heiska I have been torn between trying to get some more work done and having tourist-type fun. Initially the fun won. I went to Sastamala which has some really interesting churches, including one which was rebuilt in 2000 after a fire completely destroyed it. 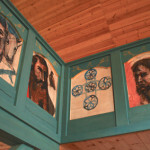 They took the decision to have 2 contemporary artists paint the internal woodwork rather than trying to recreate the original designs. 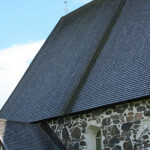 If memory serves me correctly, this was the oldest church in Finland and we had some discussion about whether this would happen in the UK or America. We thought probably rebuilding with like-for-like materials would be more likely (like the Mary Rose). 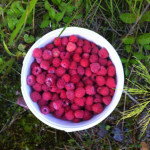 Later the same day I went rasberry picking and then the following day for a gorgeous vegetarian buffet in Hämeenkyrö. Then I had a final push of trying to make some work. I have written 2 final little pieces for the set of postcards. ‘Afterward’ will replace ‘Tomorrow’ and I will also add ‘Whenever’ to the set. In August I will be showing some work in an exhibition simultaneously in Leeds and Ghent. Yesterday I suddenly decided to try and do another word video, but in Dutch. This is possibly slightly foolish as I don’t speak Dutch. This morning I have sent a transcript for it to the curator to find out if it kind of makes sense (a strange question as the videos don’t really make sense anyway). So depending on his response it may or may not turn into a video based around the phrase ‘af en toe’ which I think translates as occasionally. I have been reflecting on how much or little it is possible to achieve in a month of making art. There are many more things that I wanted to do, than I have actually achieved. Plus I have had several new ideas and pursued some of them instead of following my original plans. I will go home with lots of beginnings, ideas and possibilities which I suppose isn’t a bad thing, although I would have liked to finish a couple more things whilst here! It’s only now, at the end of the month, that I feel I am starting to get a bit of a grasp on the area and what is here in terms of the landscape and how I may make some work in response to that. If you want to see photos of the work we exhibited at Heiska then Heather Sincivage has done a post about it here. Her blog is also a good place to get a general sense of the fun, frustrations and sometime absurdity of being at a residency like this (as well as a place to read about at her fantastic artwork). One of the real joys about being here with lots of other artists has been seeing the process that they go through to make work. Although we all have very different work, it’s a reminder that making art can often involve a fervour of excitement and production often followed by getting stuck and self-doubting, then hopefully followed by some kind of resolution! Some artists here have worked more privately – only showing their work at the end – whilst with others I have seen their work in process but in all cases the chance to talk to other artists about what they do, to see the outcomes and to get some of their feedback on my work has been invaluable.